A great buy at around $200.00! This small unit packs a punch at 8 ohms.45 watts and should do well in 4 ohm also! The MOS FET devices ahcive higher performance and reduces power consumption! This contributes to flat dampning characteristics across the audio spectrum and gives your speakers a wider range and improves detail in the mid range and high frequencies! Have been running my custom built Vifa 2-ways off my Yamaha HTR 5930! I disconnected them and hooked them up to the Elite and they just about jumped off the stands. Very Impressive! More detailed sound especially in the high section and really good bass. My only complaint with the 35R is the treble control. It does leave abit to be desired for a little nicer control! This unit runs just warm in comparison with my Yamaha, which are notoriouis for being more then abit warm. So,,,,good deal there. in 4 ohm, it will probably run on the warm side, so give it good ventilation! For around $200.00, this is quite a buy! For a small amp, it packs quite a punch, very impressive! I gave this a 3 star in overall sound of the less than $500USD integrated amps available, but it is less than $200 new. For the money a definite 5 star. This amp is very neutral, smooth, detailed, with a tight clean bass. It is not bright and does not have that artificial boomy bass that lower price equipment is known for. It mates well with quality monitor speakers on stands, detailed interconnects and speaker cable, and the better quality universal DVD players available. At least that is my system and this a good combination. If you value a balanced and natural sound in a low priced, lower powered integrated amp for a second system, that will remind you of your high-end system then look now further. If you want a flashy mid-fi piece with crisp bright highs and boomy driving bass to impress your friends than look elsewhere. I discovered this integrated amp by accident and it does not shame itself for the little money it costs. It is as enjoyable to listem to as my high-end tube based system. Where can you get a 45wpc mosfet remote controlled integrated amp remenicent of the lower powered British amps for a pitance? This amp is the North American version of the same European Pioneer A-209R model. It is a definite keeper plus really cool to look at too. Warm and consistent sound. Pleasing design aesthetics. An absolute bargain in a sea of overpriced audio equipment, this little amp provides clean, consistent and rich power, which benefits anyone, especially those with highly efficient speakers. I have two pairs of EPI speakers (Magnus A11s and A12s) wired in parallel, and this little amp makes them sing! If listening to music is your primary activity, and you're not driving a terribly heavy load, then you are going to be very pleased with this gem. Just this Elite amp and a great set of highly efficient EPI speakers. This is an economy gem. I bought this for my office system. I also hooked it up to some nice towers with ribon tweeters I recently built. Pleasantly surprised me Very clear & detailed, good headroom, warmer sounding than most SS amps. Decent phono section. Great value for the money. $170 Would make a super dorm, bedroom, or even main. I was in almost the same situation as the person below, except I intended to give this to my ten year old daughter who has taken a more than passing interest in music as of late. After hearing how good this little Elite amp is, I think I'll keep it for my bedroom and give her my old, but good sounding Onkyo receiver instead :-). I've been using a Sony SDP-EP9ES digital pre/pro ($800 list price!) as a CD DAC in my bedroom system for the last few years, and to tell the truth, I can't say I really hear a difference between its "Current Pulse" DAs and my cheap Sony CDP's DAs with the Onkyo. I was very surpised that I could clearly hear the difference with this $169 Elite in the system, and yes, the Current Pulses do indeed sound better. This little amp must be a sleeper considering I'm only the second person to post (note to Audio REVIEW: Why isn't this listed under the "Integrated Amp" review section?). This amp doesn't sound quite as good as my Marantz PM-68 in my main system, but with less than half the power at less than half the price I didn't expect it to. But I can't believe how good it does sound given the price. My remote from my main system costs more! 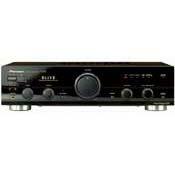 Anyone looking to put together a good quality two-channel system on tne cheap needs to hear the A-35R. A bit under powered, no sub out. Well, I was looking for a bedroom system. My main concerns were flexibility, decent (not superb) sound quality and a fairly low price tag. This pretty much relegated me to the micro/executive system category. The salesman at United Audio pointed me to this unit. I demoed it in the store with a pair of Polk RT-15 speakers and found that it sounded better than the dennon DM-3 system I was looking at! All in the system with a Denon DCM-270 open box CD changer was going to cost me a little more than the DM-3 but I would get a lot of flexibility. I know that the system is not the creme de la creme in terms of sound quaility, but it is great for a bedroom system or those without "golden" ears. The sound of Elite amps is quite warm but in a very pleasent way. I can listen to an elite amp for hours and hours. I especially liked the fact that this was an integrated amp and not a reciever. I don't use the tuner so for me that is always wasted technology. All in all, I say that this unit is a great deal for an audio enthusiest but not for an audiophile. I'm sure that they will find fault with this unit. I will say this though. It makes ME happy!